The Pug is a popular breed in Ireland: their small, big-eyed, snub-nosed, round-faced appearance ranks them high in the cuteness stakes. 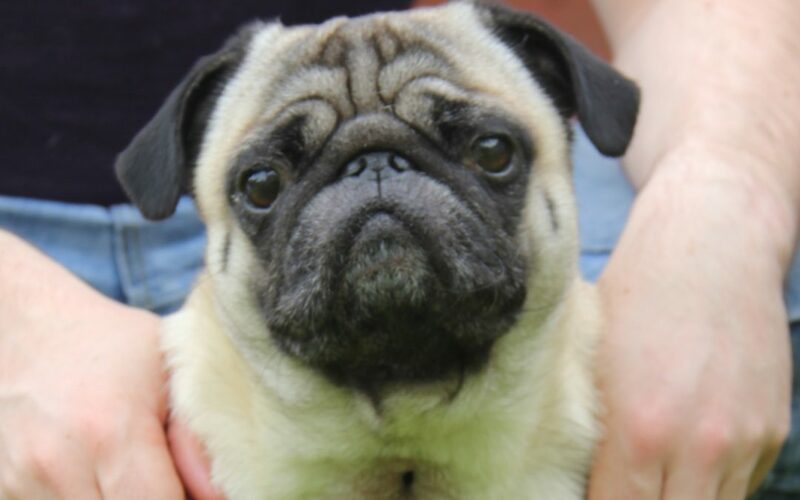 There’s one serious problem: they have been bred more for looks than function,and many Pugs have serious breathing difficulties due to their squashed-up breathing passages. The problem is known technically as “brachycephalic syndrome”: it’s so common that it’s considered normal for pugs to have noisy breathing when they get excited or after exercise..
For many pugs, the breathing problems are not serious enough for owners to be too concerned, but in Peanut’s case, a life threatening crisis meant that emergency surgery was needed. The first event happened when he was just eleven months old. He was playing with Lee in the kitchen at home, when he started to struggle to get his breath. The little dog began to panic, making the problem even worse, and he then collapsed, falling onto his side and losing control of his bladder. Lee stayed beside him, reassuring him as he slowly regained consciousness. Lee took him to the vet straight away, and an immediate referral was arranged to a respiratory surgery specialist at the veterinary teaching hospital in UCD. A full work up, including x-rays, showed that Peanut had been born with a combination of serious issues with his respiratory tract: he had an abnormally narrow windpipe, squashed nostrils that could not open wide enough, and a combination of deformities of the back of his throat that prevented the normal passage of air from his nose to his lungs. His first operation attempted to correct these issues: his nostrils were widened, and the back of his throat was nipped and tucked to allow air to flow more freely. He made a good recovery at first, but within a year of the operation, he was struggling to breathe again, and he had further episodes of collapse. He went back to see the specialist, and this time a more radical procedure was recommended: a tracheostomy. This involves the permanent, complete bypassing of the nose and mouth, by creating a permanent hole in his windpipe: it’s the same procedure that’s used in humans with severe laryngeal disease. Peanut stayed in hospital for five days after the operation, and Lee was shocked when he collected him: he had dozens of stitches, a scar running from below his chin right down to his chest and a gaping circular hole in the middle of his neck. Lee and his partner Aisling were given detailed instructions on caring for the breathing hole (stoma) : they had to clean it every hour to stop mucus from blocking it, and they had to feed him mashed up food that was easy to swallow. The little dog made a fast recovery, wanting to play within a couple of days, and he hasn’t looked back since. He has to live with some strict rules to keep him safe: obviously, he can never swim, as water would gush into his windpipe and straight into his lungs. He can never have a bath: Lee wipes him down with a sponge instead. He has to avoid long grass and sand: any situation where small particles might pass into the stoma. Lee has to be careful not to spray an aerosol near him, and to keep him out of smoky rooms. There is some ongoing home care of the stoma, keeping it clean and healthy, but there have been no serious issues. The improvement in his health has been dramatic: he now breathes quietly, he never struggles to breathe at all, and he has had no more episodes of collapse. He lives a much more active, energetic life than he was able to do before the op, enjoying two long walks every day. People who meet him rarely notice that he has the tracheostomy: Lee only tells them if they are doing something that might cause a problem, like petting him around the neck. Just as a person with a tracheostomy cannot talk easily, Peanut can no longer bark. He still tries but when there’s someone at the door, instead of barks, he just makes puffs of air through his stoma. Click the link above to take the survey on osteo-arthritis at home.